Our body has far more power to heal itself than we know. The experience of transcending promotes balance in mind and body, creating the ideal condition to activate the body’s innate healing power. Fortunately this is easy to acheive – It only requires the right technique and proper instruction. During the experience of transcending, the mind gets in a state of complete inner silence – see Being Your Self. Mind and body always go together. Where one goes, the other must follow. By allowing the mind to be effortlessly drawn to this complete inner peace, we literally pull the body into a very deep state of rest, much deeper than the rest that we experience during sleep. This can easily be measured objectively. A study from Harvard Medical school in which the resting state is measured on the basis of oxygen consumption showed that during TM practice, the body goes into a state of rest much faster and much deeper than the rest that is usually achieved during sleep. This remarkable study was published in 1971 in two well-known scientific magazines, Science (Science 27 Vol. 167 no. 3926 pp. 1751-1754 1970) and Scientific American (Scientific American 226:84-90 1972). It was repeated several times around the world with similar results. 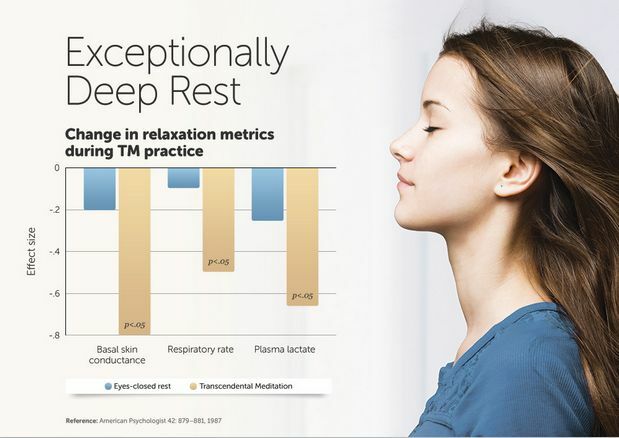 A later publication of a larger analysis of 31 TM studies confirmed the exceptionally deep state of relaxation attained by practicing TM – a state a lot deeper than that gained in normal, eyes-closed rest whether measured through breath rate, heart rate or plasma lactate (American Psychologist 42: 879–881, 1987). Yet, a number of published scientific studies have suggested a highly significant decrease or even complete disappearance of PTSD symptoms, in some cases after only 4 to 12 weeks of TM practise – for more info see Transcending provides relief from PTSD. The subjects of these studies have been exposed to the most intense stress and traumas. These studies indicate the true power of our bodies to heal themselves we if only we can activate that power. It’s reasonable to assume that, if through TM practice, such deep traumas can be relieved, those suffering from lesser degrees of stress and trauma can also find relief. If TM practitioners are exposed to a stressful stimulus, studies show that they also return to balance a lot faster. One can objectively measure how big a person’s resistance to stress is and studies suggest that transcending has a strongly positive effect (Psychosomatic Medicine 35: 341–349, 1973). For more scientific research on the effects of Transcendent Meditation on stress reduction go to the Evidence section.